Hawaii Beaches: South Shore Oahu. 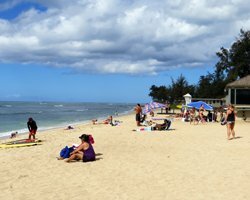 South Shore Oahu Beaches the Most Popular in Hawaii! The south shore Oahu beaches span the entire coastline from Makapuu Point through Waikiki and Honolulu to Kapolei. 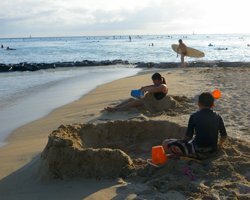 As a result of their proximity to the major city and tourism centers, these Hawaii beaches make Oahu’s south shore the most heavily trafficked stretch of coastline on the island. And as much as I dislike crowds, many of these beaches are so enjoyable anyway that they’ve kept me coming back week after week for years! 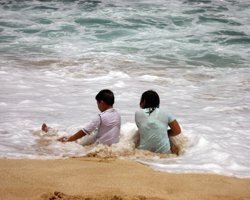 In late spring and summer, the surf goes up at south shore Oahu beaches. Yet even when it gets big, it’s not nearly as strong or dangerous as the north shore surf – but it sure is fun to ride. During the fall and winter, the surf on this side of the island usually stays quite small. Close to major resort areas in Waikiki and Ko Olina. Very convenient. Generally well-maintained beaches, bathrooms, and adjacent facilities. Generally fewer water hazards and calmer conditions at most locations. 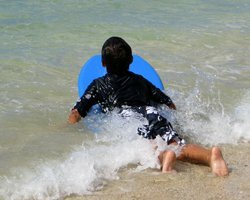 Best learner conditions for beginning surfers. Diamond Head backdrop visible from almost everywhere. Crowded almost everywhere, with the largest crowds on Waikiki Beach. Occasional box jellyfish influx (usually 7-11 days after a full moon). Just look for posted warning signs. Or if you are gravely concerned, click here for arrival predictions. I have never been stung by one of these critters. 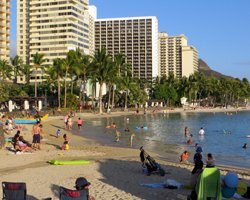 The most famous south shore Oahu beaches include Waikiki Beach, Hilton Lagoon, Magic Island, Ala Moana Beach Park, Kakaako Waterfront Park, Hanauma Bay, and Sandy Beach. Due to their enormous popularity, I had to dedicate whole pages to each of those. 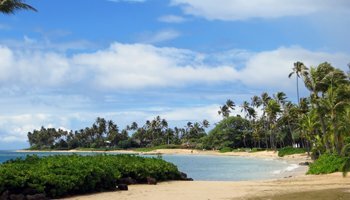 The following Hawaii beaches, however, are almost as popular with local residents, but they tend to be a little off the beaten path for many visitors. For visitors who stay at the Kahala Resort, and for many local residents in the east Honolulu area, Kahala Beach is a convenient alternative to other south shore Oahu beaches. The beach itself is beautiful; and it tends to be significantly less crowded than elsewhere. There’s also a nice park with pavilions. My only real complaint has to do with going in the water. The sea bottom tends to be rocky and sharp; and the somewhat frequent strong winds can make the water surface conditions fairly choppy. For those reasons, I don’t often go in the water at Kahala Beach. For me, it’s more of a romantic stroll kind of spot. For residents living out in the Ewa Beach area (west of Pearl Harbor), White Plains Beach is a favorite local spot. Once part of the former Barbers Point Naval Air Station, this Hawaiian beach is now open to the public. It has a well-maintained beach park with pavilions. 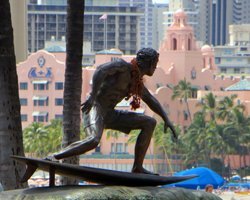 It’s also a popular place to rent surfboards and learn to surf (although the learning conditions are rarely as good as Waikiki Beach). The beach itself is wide and beautiful. There are also soft sandy patches in the water, making it a good place for swimming. There’s a fantastic view of Diamond Head; and the crowd size is usually moderate. On the potential down side, the shore break tends to be rougher than most of the rest of south shore Oahu (but not even close to Sandy Beach). For my kids, however, this is a plus; but I would worry about young children who can’t yet swim. It also seems like the lifeguards keep irregular hours, so be aware of that.